In terms of fancy debuts in the SGV, Shanghai No. 1 has got to be right up there. 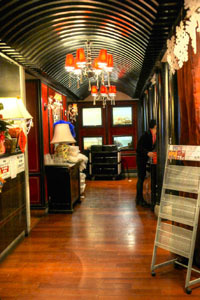 It opened at the end of 2011, an outpost of a mini-chain originating, appropriately, in its namesake city. 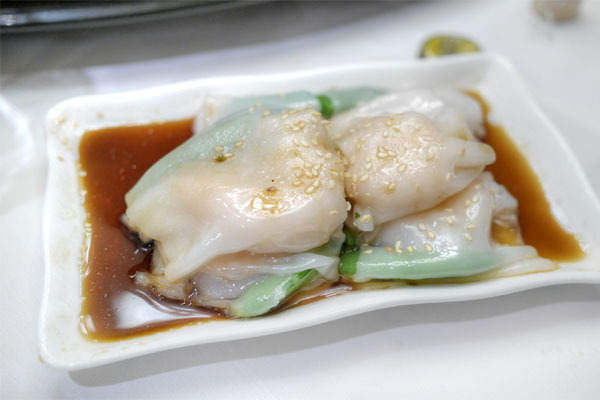 Not surprisingly, the place is a Shanghainese eatery at its core, but during lunch, good ol' dim sum dominates. Shanghai No. 1 takes over the former home of the old Green Village, and I believe King's Palace before that. 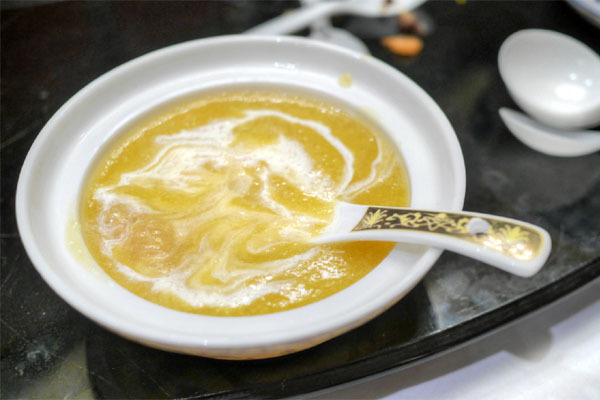 The space has been completely redone, and is no doubt one of the more opulent Chinese restaurants around, evoking sort of a faux 1930s Shanghai Bund vibe. 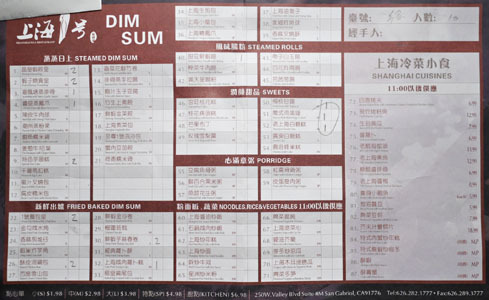 Here we see the dim sum menu, which features your usual Cantonese yum cha fare along with a few more Shanghainese-leaning specialties. 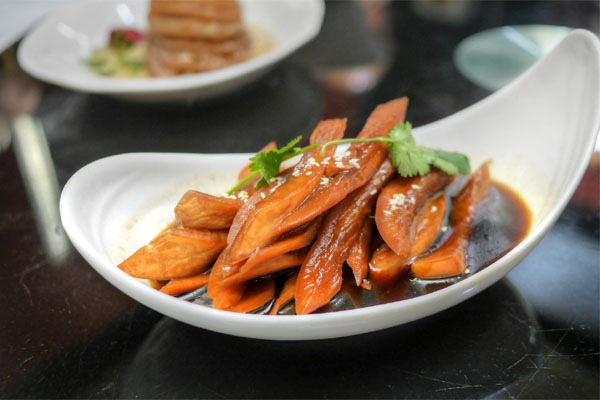 You can also order items from the dinner menu (not pictured), which, famously, is physically one of the most impressive in all of Los Angeles. Click for a larger version. One of my dining companions was able to secure a flat $15 corkage fee, so we brought along our own beers and wines. 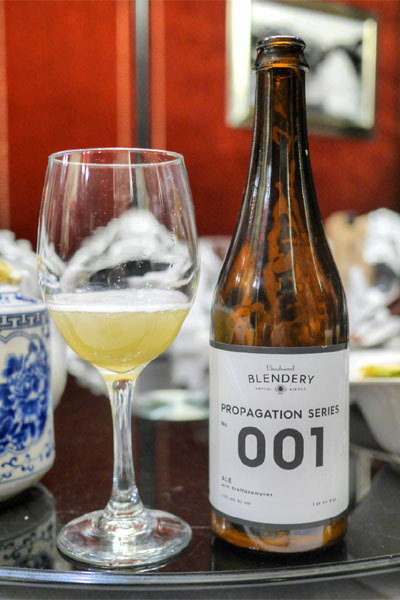 First was the 2015 Beachwood Blendery Propagation Series: No. 001, a petite saison with Brettanomyces that represents the first bottling from the new offshoot of Beachwood BBQ. I'd had the beer on tap when it was released back at the start of November, and I think it was better from the bottle. I got a bouquet of bright, juicy stone fruit and citrus intertwined with Brett, while the taste went tart, refreshing, with a musty funk to it. We were quickly brought out a tray of cold appetizers to choose from. We opted for three selections, starting with this superb presentation of radish. Excellent crunch here, and I liked how the radish's light, bright flavors played with the sweet, savory sauce present, the sesame adding a great nutty accent to everything. Cucumbers were satisfyingly crunchy, perked up by a bevy of savory, spicy flavors. 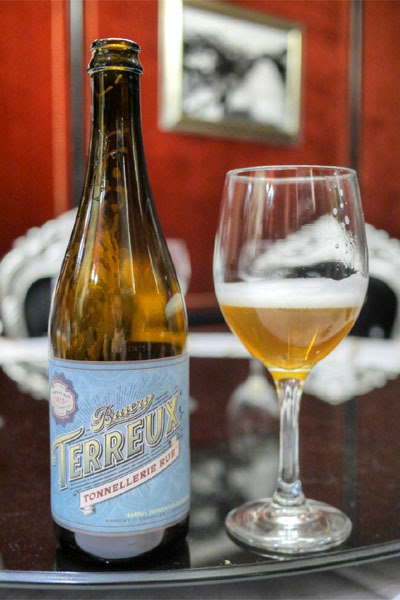 Next came the 2015 Bruery Terreux Tonnellerie Rue, a oak-fermented saison. This was definitely a more rustic interpretation of the style, with an earthy, sour nose and a flavor profile that veered tart, tannic, dry, barnyard, with a spicy rye-like element. 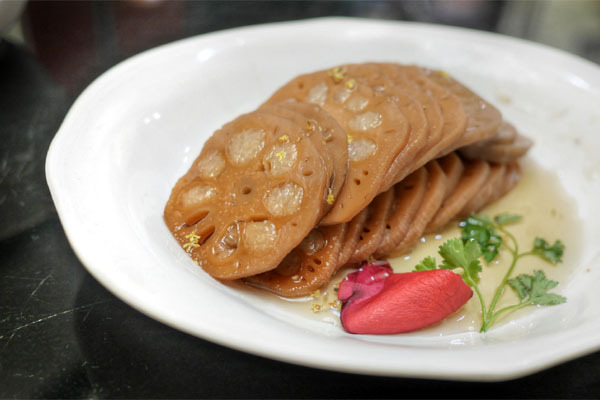 Lotus root delivered as well, with its firm-yet-yielding, almost potato-like texture and sugary filling of rice hitting all the right notes. 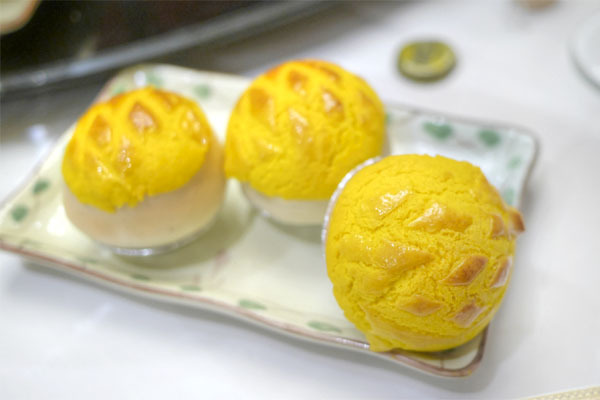 The classic cha siu bao showed off all the sweet 'n' savory notes that you'd want, with an extra bit of offsetting herbiness that I really appreciated. Xia chang was tasty too, the shrimp coming out all briny and snappy, augmented by the richness of the soy-based sauce while snap peas imparted a well-placed crunch. 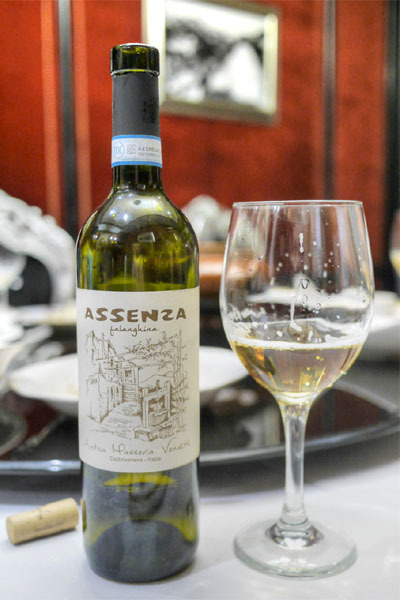 We then moved on to wine, beginning with the 2014 Venditti Falanghina "Assenza". 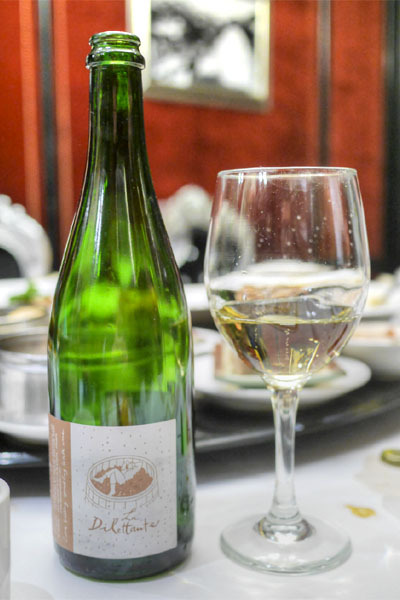 Made from 100% Falanghina, this was deeply floral, citrusy to the smell, with the palate coming up fruity, rich, with a grassy component to it and medium acidity. Here was Shanghai No. 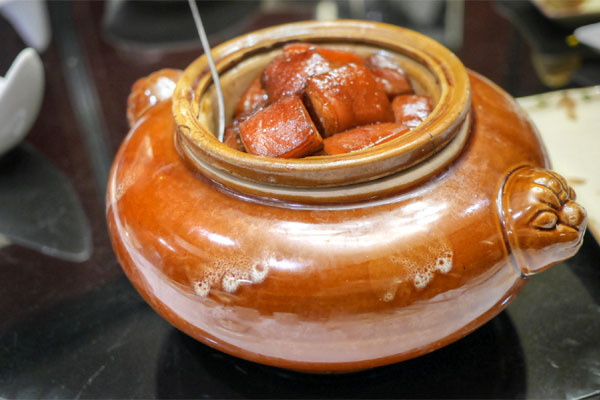 1's signature dish, a hongshao-style pork in a rather impressive looking vessel. 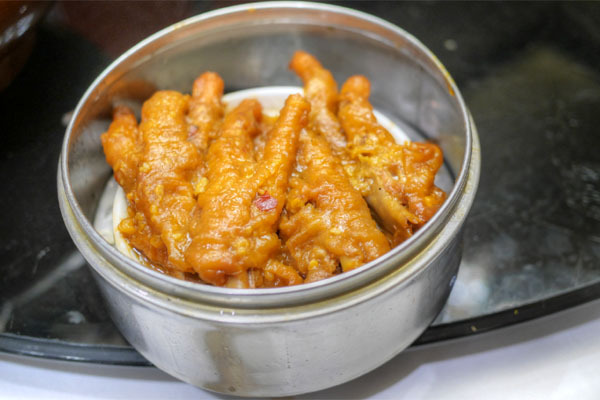 It was a crowd pleaser, with the belly arriving melt-in-your-mouth tender, encased in layers of gelatinous fat and teeming with boatloads of sweet, savory, sticky flavors. The chicken bun was one of the better versions I've had, with a gratifying base of salty, meaty bird augmented by a slight sweetness. Nice flakiness on the actual pastry, too. The paigu was a table favorite as well. Think supple, with a subtle chew and deep garlicky flavors. Here came the NV Pierre et Catherine Breton "La Dilettante" Vouvray Brut, a sparkling Chenin Blanc from the Loire Valley. I found this a mature-tasting wine, oxidative and fruity and somewhat honeyed to the smell, with a palate that showed more of the same, joined by a palpable tartness, acidity, and countering spice. We only opted for one order of feng zhua. I'm not a huge fan of the stuff, so I let some of the others have at it. They seemed to be pretty impressed, especially with the bird's fluffy, gelatinous consistency. 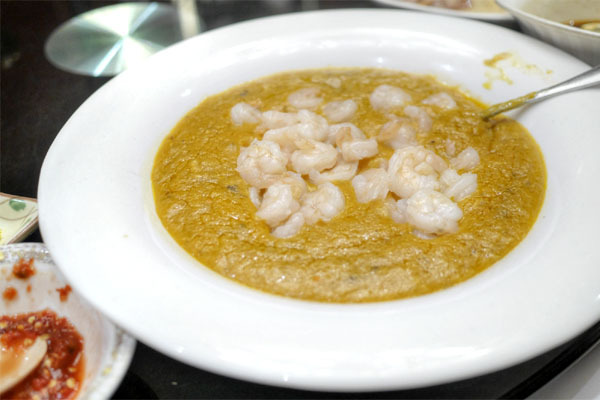 Here was another dish from the dinner menu, one that we likened to a gumbo of sorts. With all its deeply saline, roe-enhanced flavors, this would be fantastic over rice. Ha gow was enjoyable, perhaps a touch thick on the skin, but with properly briny, snappy shrimp within. 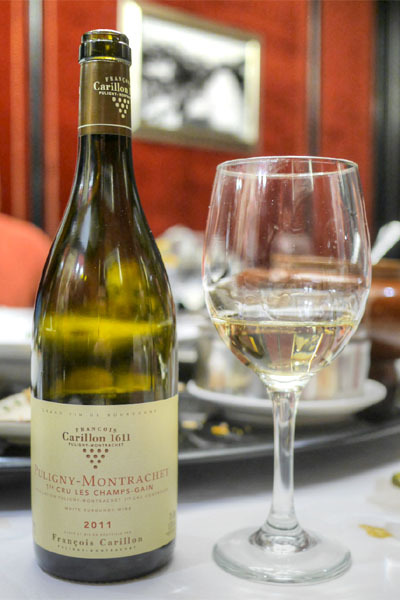 Our third and final wine was certainly the weightiest of the bunch, the 2011 Francois Carillon Puligny-Montrachet 1er Cru Les Champs-Gain. Nose went grassy, saline, earthy, with an undercurrent of stone fruit. On the tongue, I found the wine smooth, buttery, a bit savory/spicy, with further notes of tropical fruit and hay. 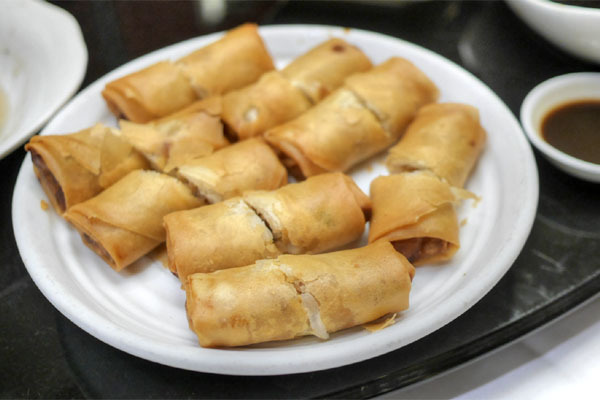 I wasn't expecting chun juan when I ticked this off on the menu, but people really seemed to enjoy the egg rolls, which were crisp and delightfully flaky, with an interesting sweetness from the taro. 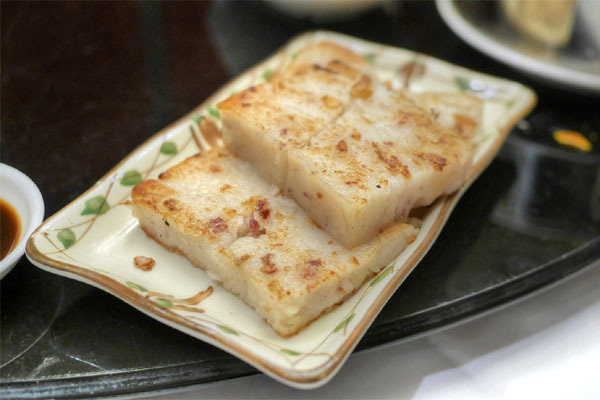 Luobo gao is one of my go-to dishes for dim sum, and this was a fine example of such, with a particularly intense funk and umaminess. 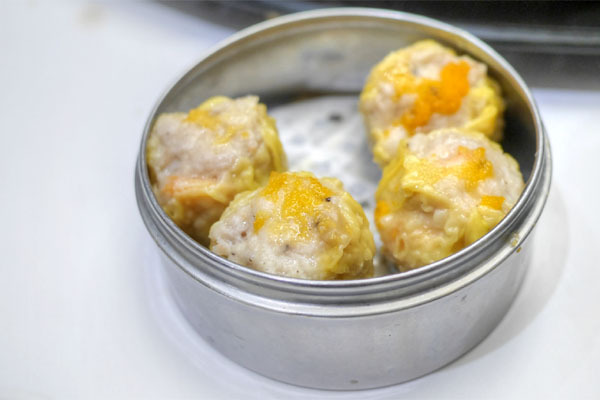 Shumai seemed to be larger than usual, but were spot on in terms of taste and texture. 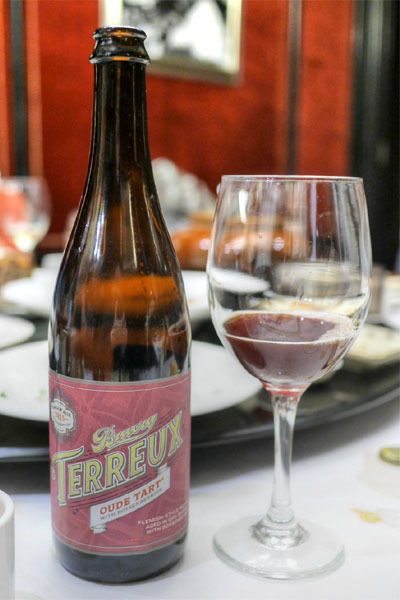 We moved back into beer at this point, specifically the 2015 Bruery Terreux Oude Tart with Boysenberries, a Flemish-style red aged in wine barrels for 18 months. I enjoyed it, getting lots of dark fruit and oak in the nose, while the palate displayed more juicy berry, along with a dry, tannic quality. Interestingly, one of my dining companions likened this to "flat Lambrusco." Our final dish from the dinner menu was sort of a fun one. 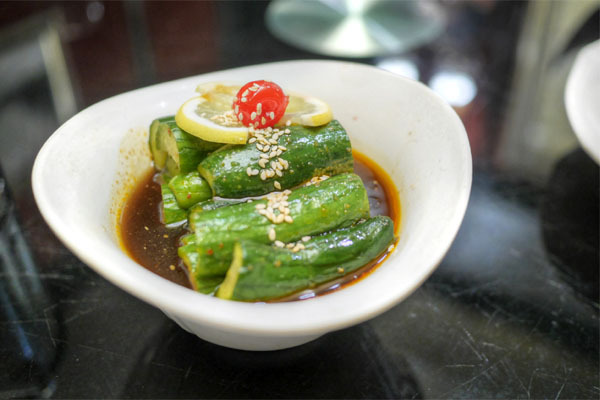 We got cold, thin-cut slices of fatty pork, perked up by crunchy-cool slivers of cucumber while chili sauce added a lovely hit of heat and mala-type spice. 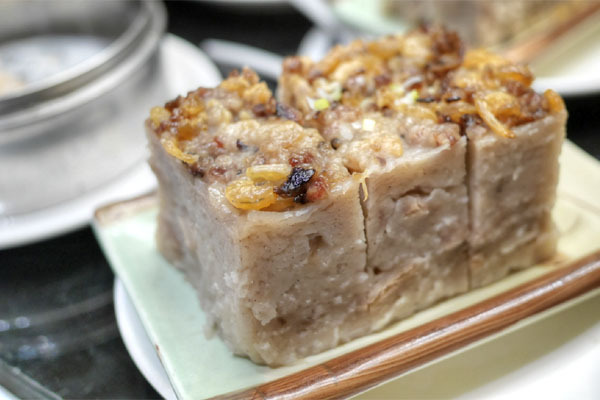 The yutou gao was a particularly dense preparation, with sweet-nutty flavors heightened by the brine of xia mi. 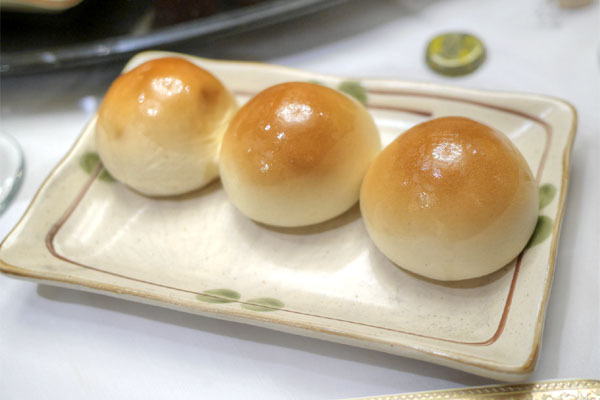 Our final savory course brought out the shengjianbao, a type of pan-fried bun originating in Shanghai. 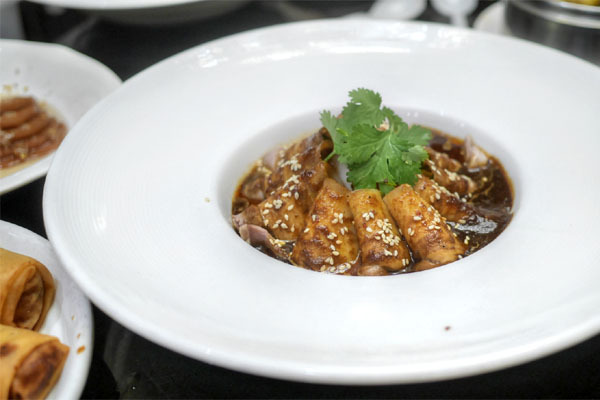 They were a must-try, texturally a mix between crispy bottoms and fluffy tops and stuffed with savory meat and a heady, porky broth, the sesame imparting a nutty accent to it all. 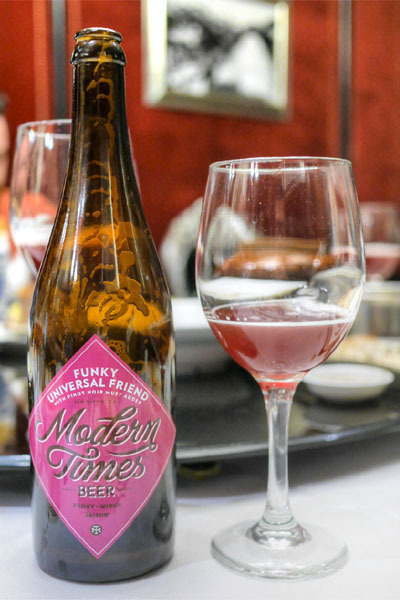 Last to drink was a saison, the 2015 Modern Times Funky Universal Friend with Pinot Noir Must. For me this was really, really grape-y on the nose and the palate, with loads of tart, tannic, and funky Brett notes underscoring everything. Note that we'd had the Pinot Grigio version of this not long ago over at Hanjip. I'm not sure if the "Topiocal" called out on the menu should be referring to "tropical" or "tapioca," but whatever the case, the dessert was strangely reminiscent of pureéd fruit cocktail. Sweet and refreshing. 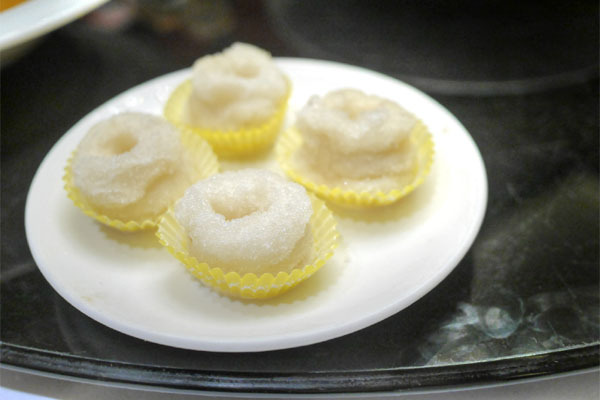 This was a new one for me: fluff, chewy, sticky little rings, covered in sugar. Not bad. 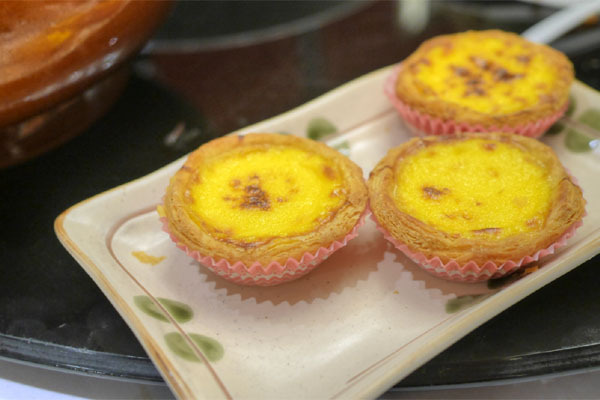 We closed with dan tat, a Portuguese preparation with burnt sugar on top. A couple people at the table declared these the best they've ever had, and I can see why. A perfect combination of sweet and eggy flavors accented by char, all in a flaky package. A lot of people seem to hate on Shanghai No. 1, but based on this meal, I'm not sure why such vitriol is justified. 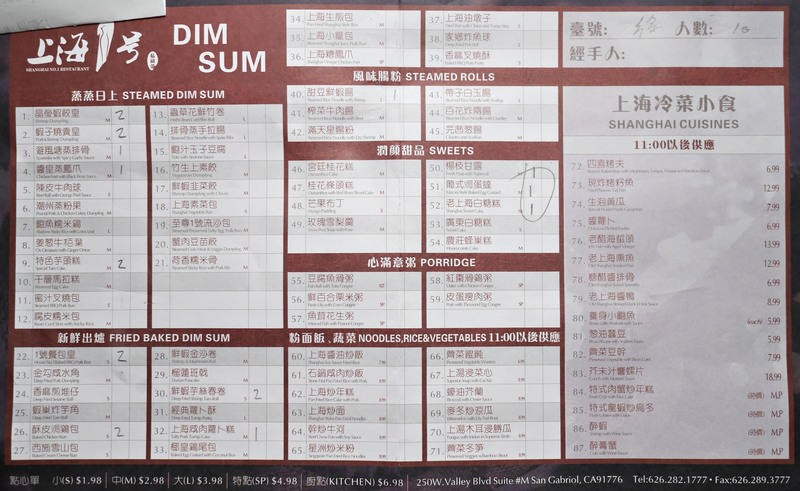 At least as far as dim sum is concerned, in my mind the food's competitive with the better spots in the SGV, and I'd actually be curious about coming back for dinner. I'm pretty convinced that the SH#1 haters complain mostly on the basis of it being upscale. 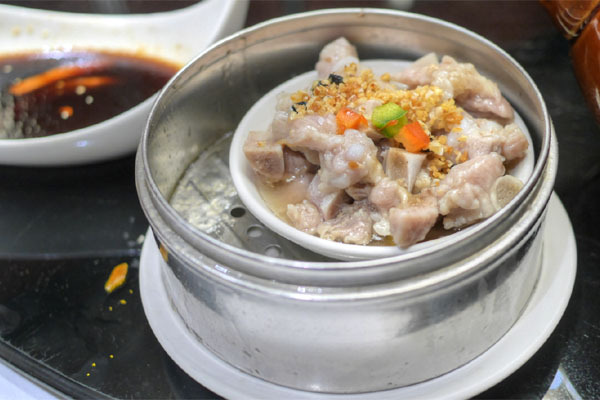 Not that it's expensive by any real kind of restaurant standard, but it's more than a dated cart dim sum place like OceanStar -- therefore, they whine and complain. 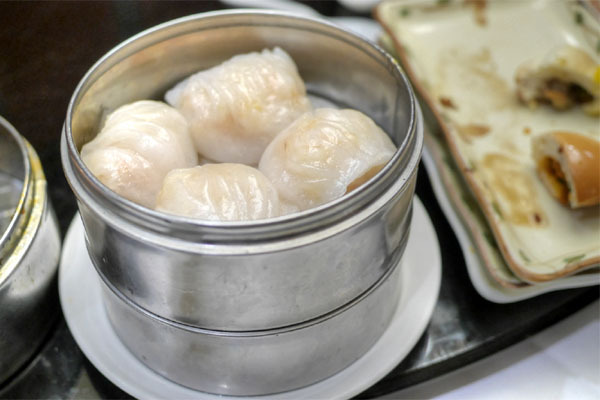 Dim sum and Chinese diners often seem to assume that Chinese food "has to be dirt cheap." For me, it's about "is it good." 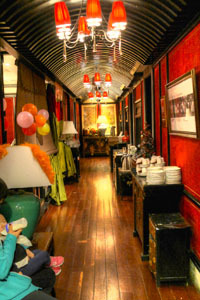 SH#1 has quite good dim sum, as you experienced. I like Elite, King Hua, and Lunasia a bit better, but SH#1 is still great. SH#1's Shanghai dinner is also very good. 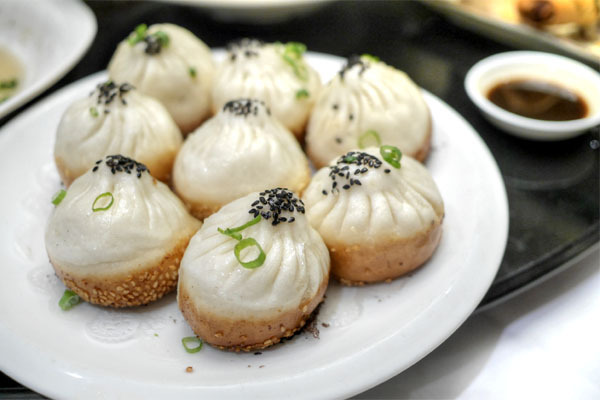 Really, there are just so many great Chinese options in the SGV. Andy, I can always rely on you to comment on a dim sum post lol. But yes, I think you're probably on to something regarding SH#1's perceived fanciness.